London has always been one of the best cities in the world for live and electronic music, but recently the city’s promoters seem be outdoing themselves. You can never be bored in this city. Here’s a roundup of the best London events this weekend. Data Transmission will be co- hosting a monster night with The Upfront Project in Vauxhall’s Lightbox. Studio Barnhus, which is the collective talents of Axel Boman, Kornél Kovács, Petter Nordkvist, all of them outstanding in their own right, so you can imagine what a force they are together. There’ll be support from Crosstown Rebels Russ Yallop, who has been championed by Radio 1’s “In New Djs We Trust” and Jamie Jones, as well as Max Chapman, and the eclectic Italian DJ/Producer SLOK. We’re big fans of London promotions company Hyponik here at Audio Doughnuts. So much so, we posted about their forthcoming 10th birthday here. They’ll be celebrating at Birthdays in Dalston, with a lineup that includes a secret headliner from Hyperdub, Brackles, Mr Beatnick, and newcomer Lakosa. Tickets are free: just sign up here. Here’s Lakosa’s mix for Hyponik, a selection with a perfect weekend warm-up vibe. 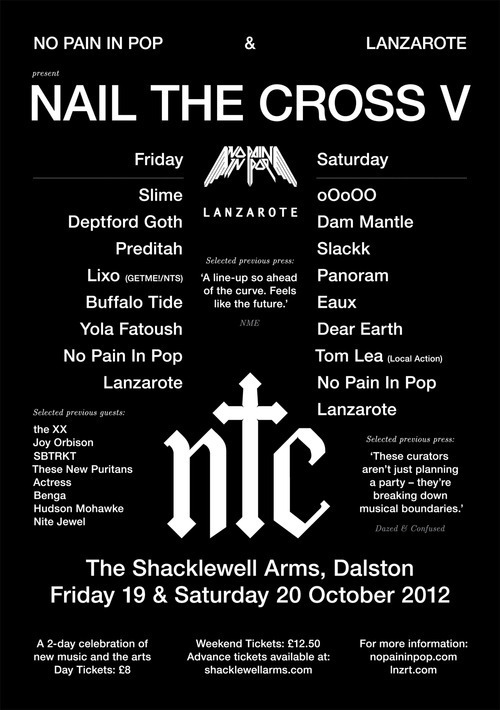 No Pain in Pop celebrates the 5th Nail the Cross Festival with a lineup that includes Tri Angle synth-wonder oOoOO, experimental producer Dam Mantle, Local Action artist Slackk, plus more. It’s one of Saturday’s weirder offerings, and perfect if the thought of 30 hours clubbing Berghain-style makes you feel a little bit overwhelmed. As any partygoer in London will attest, Fabric is the bellwether and the hub, the nexus of London clubbing. Suffice it to say, they’re celebrating in style with a non-stop 30-hour party with a lineup that includes Marcellus Pittmann, Craig Richards, Ben UFO, Sigha, Sandwell District, and many more. Live, colourful, maximalist electronic music comes courtesy of band Teengirl Fantasy, while support is from London vocalist Py. Download her fantastic “Tripping on Wisdom” mixtape here. There’s also support from mesmerising singer-songwriter Dillon.